Sure, Nabors Industries stock looks cheap, but the company's slow recovery and bizarre management decisions mean investors should stay away. After years and years of promising to get its debt situation under control, rig owner Nabors Industries (NYSE:NBR) started to deliver on that promise in the second quarter. 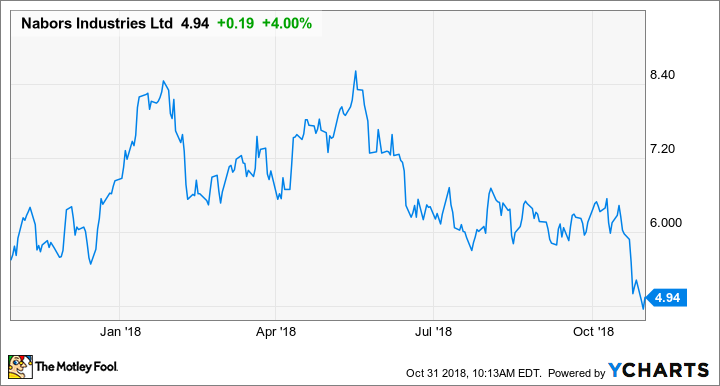 This past quarter, the company made some further progress, but investors looking to invest in rebounding oil prices and drilling activity aren't going to like what they get out of this stock. Here's why, despite the improvements in Nabors' recent earnings releases, investors shouldn't be tempted to buy this stock no matter how cheap it looks on paper. DATA SOURCE: NABORS INDUSTRIES EARNINGS RELEASE. EPS = EARNINGS PER SHARE. Unlike most of Nabors' peers, which generate a vast majority of their earnings from North America, Nabors has much more international exposure, with more than 150 rigs deployed outside of North America. Those international assets haven't experienced the same surge as U.S. shale or even Canadian drilling, and that weakness offset its U.S. adjusted EBITDA, doubling compared to the prior year. Data source: Nabors Industries. Chart by author. From an operations standpoint, almost all of Nabors' high-specification rigs in the U.S. are contracted and working. That's great news, because it means it will be able to extract more favorable terms when it signs contracts to upgrade some of its other rigs for a customer contract. At the same time, though, the company continues to carry an unusually large amount of legacy assets that don't have much value today. It would be in the company's best interest to get rid of these assets so it isn't running up costs to keep them in the fleet. In Nabors Industries' press release statement, CEO Anthony Petrello discussed the improvements to profitability he and his team saw in the most recent quarter and some of the financing moves it has made recently to shore up its balance sheet. The U.S. Drilling segment was the highlight of the third quarter, primarily attributable to the strong performance of the Lower 48 drilling operation. Average daily rig margins in that operation exceeded $8,700 -- a $1,300 per day sequential increase -- due to the combination of increasing rates and a decline in operating costs. In our other drilling segments, results improved seasonally in Canada, but declined in the International segment due primarily to the divestiture of our jackups and higher operational and reactivation expenses. During the quarter, we redeemed the $303 million outstanding of our 9.25% notes, which were due in early 2019. Our next debt maturity is not until late 2020. After the quarter ended, we amended our existing revolving credit facility and added a new $1.27 billion revolving five-year facility providing us with good long-term liquidity. With oil prices rebounding and producers looking to increase their capital spending, Nabors would look like a perfect candidate to play the industry rebound. Its stock trades for only 0.58 times book value, it has a majority of its high-value rigs operating and generating decent margins, and there are signs that its international business is picking up as well. Despite these positive traits, Nabors' management has struggled to make good on its promises to get control of its debt load and, for some reason, insists on retaining several rigs in its fleet that are old and don't really have a place in today's drilling environment. Keeping these rigs on the books just eats into operating cash and profits. Why these rigs are still on the books is a real head-scratcher. Also, the company has been overloaded with debt for most of this decade, with little to no progress to show for it. Management is touting its new financing agreements and paying down some of its near-term obligations, but until the company makes significant progress in reducing its debt load and proving that it can string together a few quarters of profitability, it's just not worth investing in.